This bright and airy apartment, boasts traditional features such as high ceilings and a Maltese timber balcony overlooking St. Paul's Street. 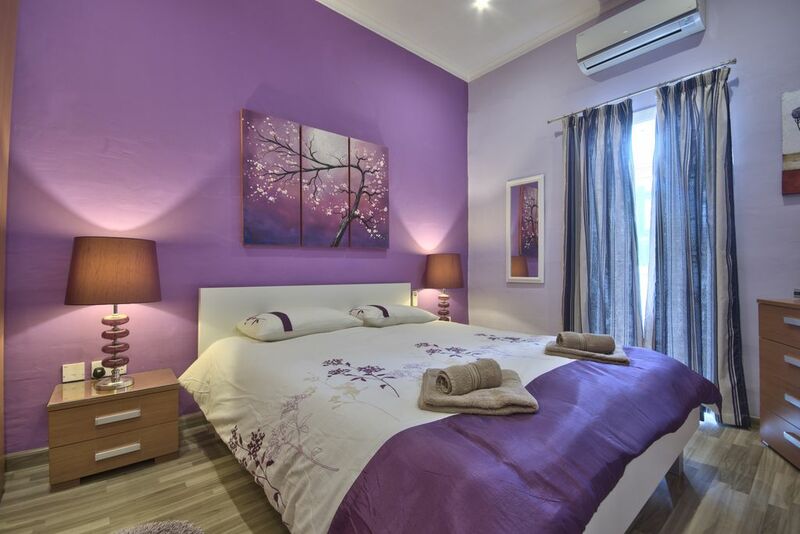 The well-appointed 100 sqm property, has been finished to a very high standard, with all amenities that one would expect to find in 5-star accommodation, yet still offering a cosy and intimate setting. The apartment is located on the second floor and is accessible by elevator. The property is in a prestigious neighborhood, a stone throw away from the city center and major attractions such as the Upper Barrakka Gardens, St John’s Cathedral and the Auberge De Castille. Furthermore, the neighborhood also boasts two bakeries, cafes and some unique boutiques. Our esteemed guests are welcome to make use of a spacious communal roof top garden which is shared with only another two apartments in the block. The garden boasts a sheltered area with lounge furniture and a barbecue area for guests to use at their convenience. The highlight of the garden is that guests can enjoy breath-taking views of the Grand Harbour entrance, the sea beyond and the city’s sky line – the perfect place to unwind and relax. We believe in offering our guests a personalized service and there is always someone available to assist and advice you on the best places to visit & dine to ensure you experience the best that Malta has to offer. Professional contractor and property renovator.Project Manager and Property manager within Valletta and Malta of many years experience. A good communicator speaking fluently English and Italian. Married with a beautiful daughter and enjoys family life.Also lives in this unique city full of history and events. This is the most desirable location in Valletta and also know as good for its neighborhood.Central location and easy to reach all historical attractions,restaurants, A car is not necessary for getting around Valletta, Few meters from St. John Square the main square and Republic Street, Valletta's High Street, the Valletta fruit and vegetable market, food stores etc. Buses to all destinations in Malta leave from the terminal a 5 min walk away. The location is superb to experience the true Maltese culture through the wonderful examples of Baroque architecture and the experience of the centuries old inheritance of the Knights of St John. This property is without comparison in the central area of Valletta. All of the conveniences of a five star services are provided with the additional touch of a friendly and personal attention to detail. 1 Main bathroom for entire apartment comprising of a combined bath and shower facility including an automatic washing machine.Good size bathroom. Valletta is surrounded with rocky beaches. Fresh linen is provided on arrival. An automatic washing machine is for the private use of the apartment. Fresh towels are provided on arrival. Gas oven with also an electrical grill. The kitchen is equipped with many dishes and utensils. Roof terrace is equipped with many outdoor furniture, many plants and beautiful grand harbour views. In the apartment there is a Maltese traditional wooden balcony. Many areas are available for the use of all clients.The roof terrace space is quite and spacious. Prices are for 2 people sharing. Extra guests pay Euros 25 per night 30% non refundable deposit - balance on arrival in cash Euros or credit card. Charges apply for notifications of less then 30 days prior to arrival Check-in is 24 hours ( no extra charge for late arrivals ) but guests must always communicate expected arrival time ..... flight number..... point of origin.... in advance in order to arrange the airport pick up and to confirm check in time, Sliema Water Taxi 5 minutes walk away • City Center 2 minutes walk away • Bus Terminus 4 minutes walk away • Plenty of Bars and Restaurants in close proximity • Lots of Museums in close proximity. Cleaning / Towels / Bed linen are provided on arrival. Cleaning is free on arrival and departure.It is expected that you leave the apartment in a clean and tidy order. All rooms are bright and airy .One can notice that the apartment has high ceilings,very spacious and with separate rooms. The apartment was clean and comfortable - perfectly situated for exploring Valletta. The proprietor, Patrick, arranged taxi transfers from and to the airport and made us feel very welcome. Patrick, the owner, was friendly and organised, providing everything we might need. Valletta is beautiful with an interesting history & we made the most of the warm, sunny weather. We stayed in January and were pleased to find that the apartment was very cosy and warm. Everything worked as it should, the bed was comfortable as was the sofa. We were a five minute walk from the bus station allowing us to travel all over the island using the excellent bus service. There were shops, restaurants and cafés within a minutes walk. Patrick was attentive to us and genuinely wanted us to have a good time in his lovely apartment. This apartment is in the Best location in Valletta. A short walk to all the busses and ferries. Also 2 min walk from the main high street with all the shops and restaurants.Everything was super clean and the kitchen is well equipped. Patrick was a FANTASTIC host very efficient and kind. He even gave us a farewell gift from Malta a lovely personal touch! The only reason I didn’t give the apartment 5 stars is because it was quite hot without air conditioning in the kitchen and lounge area but I believe it’s on the cards! Best is that there is a lift. Believe me nobody wants to climb stairs in the heat!! Thank you for your review and your comments regarding our apartments. It was our pleasure accommodating you and your family and we are glad that you were comfortable in our apartment and also in our central location. As for the air conditions as we already discussed this during your check out yes at the moment we planning to install a new ac system. We always try to do our best to upgrade our apartments so our clients will be more comfortable. Once again we would like to thank you for staying with us for your holiday and hope we will have the opportunity to accommodate you again in the future. Everything from our arrival went perfectly. From a personal greeting & welcome by Pattrick all the way through to the apartments and the amazing views on the roof terrace, everythign far exceeded what we ever imagined for this property. All in all it was an amazing experience and we cannot wait to hopefully return in the near future. Great location 8 min walk from the main bus station making the entire Island accessible within 1hrs journey. And the main street is simply 2 corners away. Great place to swim is down by the Grand Harbour too. First of all we would like to thank you for your stay and glad that you have enjoyed our accommodation and that you were comfortable. We would like to thank you for your review and for all your comments. We try to give the best holiday accommodations to our clients. Once again thank you and hope that we can accommodate you again in the near future. Excellent apartment in the heart of Valletta. Stunning views of the harbour from roof terrace. Patrick was an excellent host who was waiting for us outside the apartment on arrival from the airport. He explained all we needed to know in his beautifully maintained spacious apartment.A welcoming bottle of wine, fruit, bread and milk was much appreciated and showed the exceptional care Patrick has in his guests. Our first lunch we enjoyed on the roof terrace with stunning views of the harbour and the 3 cities in warm sunshine (in January!). Valletta is a fascinating and compact city with all places of interest within easy walking distance. The bus service to other parts of the island are reliable and cheap. Would absolutely recommend to our friends and hope to come back ourselves some day. We would like to thank you for your stay and for all your comments in your review about us and our apartment.Glad that you have enjoyed your stay and hope that we can accommodate you again in the future.Once again thank you for your stay. There is also a rocky beach in Valletta on the marsamxett side and there are also restaurants there including the Sliema ferry.Its a 10 minutes walk from the apartment. Airport: Luqa: 6 km. Arrival and return transport can be pre booked with us. Return to airport transport on departure day is available. Also we are 3 minutes away from the Malta bus terminus from where you can get a bus to every destination in Malta. Lots of museums in close proximity. Close to the upper barrakka gardens which one can enjoy magnificent harbour views and also can make use of the new panoramic glass lift built recently. Please note that rates are for 2 persons.Each extra bed cost 25 euro per night.30% Deposit required to secure booking. Kindly note that on arrival you will be requested to pay, in cash the Environmental Contribution, this is as mandated by the Government of Malta, and is separate to the booking fee. The Environmental Contribution is calculate as €.50c per person per night up to a maximum of €5.00 per person per stay.This applies for 18-year-old and older.